Are you a vintage jewelry lover? I don't wear much jewelry but when I do get dressed up and go out, I must have a beautiful necklace, earrings and rings on! For those who love all things vintage, let me introduce to you 1928 Jewelry. It is for the chic fashionista on the hunt for affordable antique and vintage inspired jewelry and accessories. Their designers take cues from all your favorite eras and fuse them with the latest trends. Take a peek through their site and you'll find styles that are simple and charming, elegant and classy, bold and dramatic or quirky and unique. The 1928 Jewelry Company was founded by Melvyn Bernie in 1968. Currently, the company has four lines under its signature brand name. The 1928 Brand has sought to provide exceptional value to the fashion savvy consumer who is dedicated to building her vintage jewelry collection with unique accessories. The jewelry in the 1928 collections are designed to respect the details of period pieces while offering fresh design interpretations to fit today’s styles and fashions. This necklace has a timeless elegant appeal and exudes a feeling of refined grace. The polished hematite tone links are set in a wheat style chain. The rectangular pendant is an open back frame with an ornately designed bail. 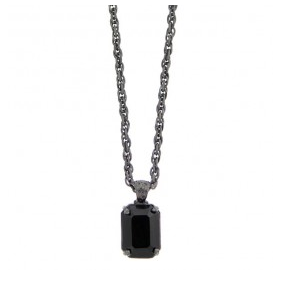 The mysterious crystal is emerald cut and jet black. Simply stunning! I love this necklace and wearing it with so many different outfits. It isn't too big or too small and I love the vintage look! Shiny, sleek hair deserves and accessory that can match! 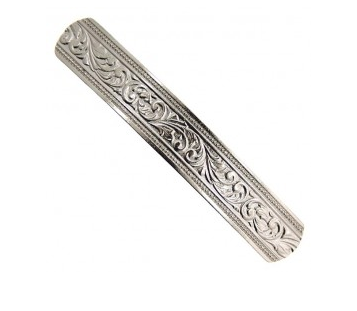 This silver tone barrette measures 4” across and only ¾” thick. Decorated with a vintage inspired floral pattern, this is a classic hair barrette that will work in many different hairdos. I have been searching for a sleek and sophisticated barrette to hold my hair up and this barrette is the perfect size! I love how it is perfect to go with every outfit! Buy It: You can purchase all 1928 Jewelry from the 1928 Jewelry website. Win It: 1928 Jewelry is generously offering (1) Bonne Nuit Emerald Cut Pendant Necklace to a lucky winner!